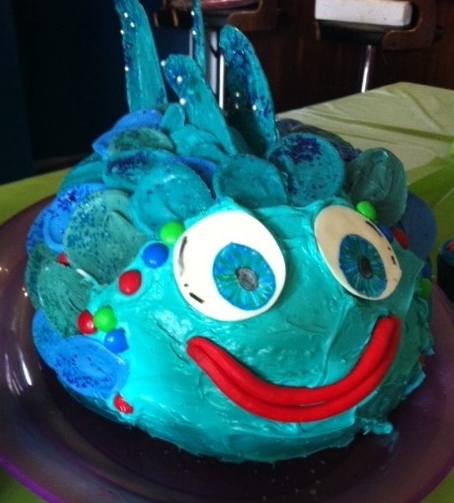 You might recall my recent post with the Big Blue Fish Cake that I made for my Mr 6’s birthday party. Well, it seems these days that the main birthday cake isn’t enough. You still need cupcakes (well, of course. D’uh, Mum!) 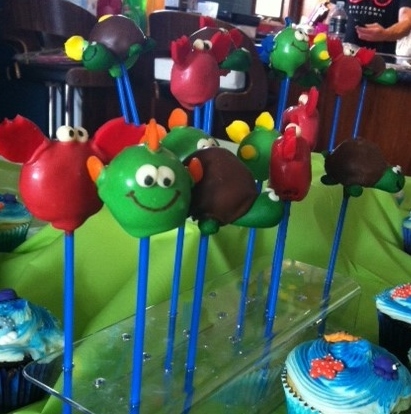 and the latest trend in cakes – cake pops. 1 packet of Tim-Tam biscuits. For those of you outside Australia who might have difficulty getting your hands on our national treat, apparently Oreos work too. 80g of cream cheese. I used the Philadelphia brand. Ice cream sticks or similar. I used plastic ones from my Cake Shop. 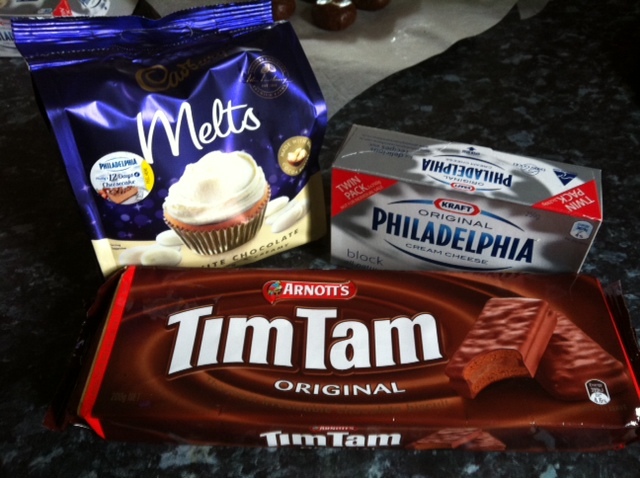 I made a triple batch with three packets of Tim-Tams and 240g of cream cheese. All you need to do is throw the biscuits into a food processor, give them a bit of a buzz, then add the cream cheese and process until combined. That’s it. Truly. 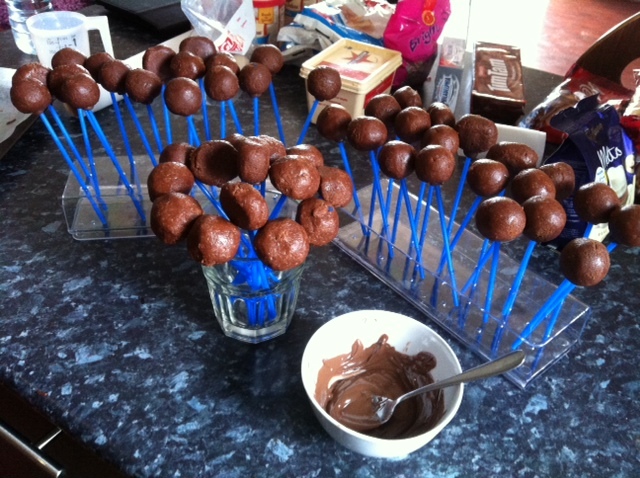 Next, roll teaspoon sized scoops of the Tim Tam mix in your hands to make ball-shapes. I kept some as balls, flattened others out into disk shapes (for the crabs) and then for the turtles, just flattened the bottoms. Place on a tray or plate with baking paper. Refridgerate. While your balls are chilling, melt a small cupful of chocolate. I use the microwave. Remove the chilled balls, dip the end of a stick into the chocolate, and then into the ball shape. I found it easiest to place upright in a glass, then back in the fridge to set. While your shapes on sticks are chilling again, it’s time to make up the accessories that will turn your balls into sea creatures. I used mouldable chocolate, which is kind of like plasticine – but waaay yummier – for mine. This stuff comes already coloured, so it makes your life much easier. Fins and tails for the fish, nippers for the crabs, heads, feet and a tail for the turtles. Oh, and eyeballs for all of them. Don’t forget the eyeballs! Working with one type of creature at a time, melt more chocolate. This time, use a bowl and don’t skimp on the amount. You need to be able to dip your shapes so that they’re entirely covered. 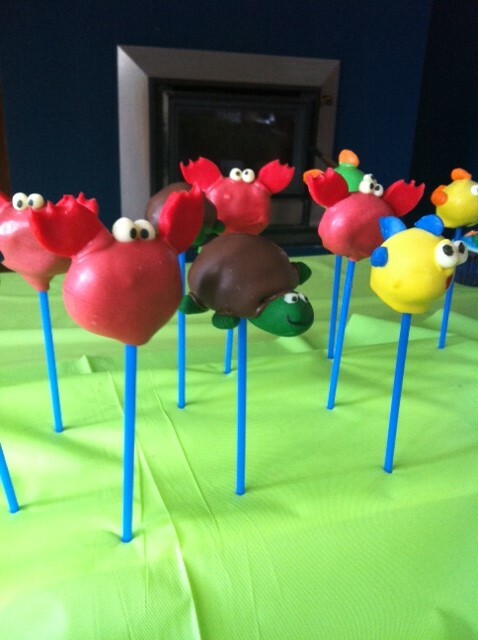 For the turtles I used dark chocolate, the crabs and fish I used coloured white chocolate (make sure you use chocolate-friendly colouring). It’s easiest to make one creature at a time – dip it in the chocolate, wait for the drips to stop, then add its accessories. After setting, I added smiley faces and pupils in the eyes with an edible marker pen. And the cupcakes? Yeah, they were a cheat too. 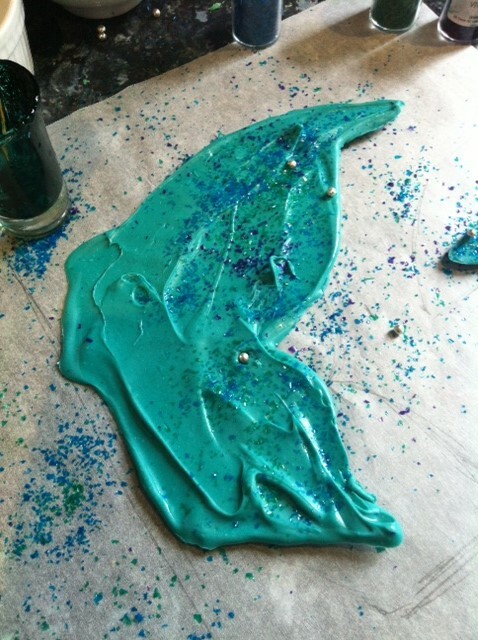 Packet mix (both chocolate and vanilla), commercial frosting – vanilla – piped on top, then with blue spray colour (just like spray paint in a can) gave them a quick whiz over, and added store-purchased candy sea creatures. Too easy! And yes, the birthday boy was thrilled. Raspberries and Blueberries and Strawberries – oh my! Suddenly – it’s that time of year again. All the hard work through the winter months in the garden is starting to pay off. I can pick an almost complete salad from my garden of greens and herbs, the tomatoes are beginning to flower (ready for sauce and chutney around February / March), the chillies and capsicums are blooming, celery is growing taller by the day – as is the sweet corn – the beans and snow peas are curling their way up supports and the zucchini is spreading far and wide. But the real show that summer – and Christmas! – has arrived here in Australia is the berries. 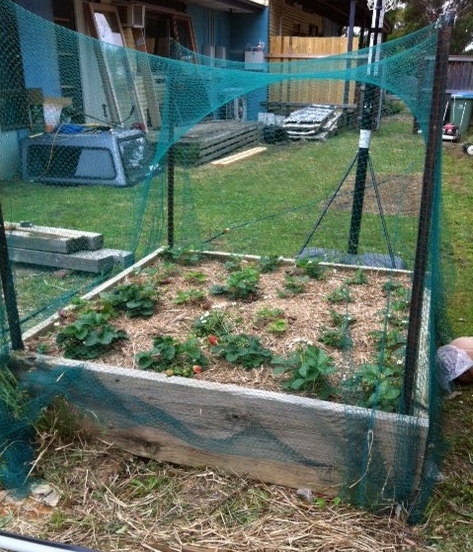 We’ve been growing blueberries, raspberries and strawberries for a few years now. I have three blueberry bushes in pots that are, for some inexplicable reason, suddenly giving us extra fat and juicy fruit this year compared to last season. 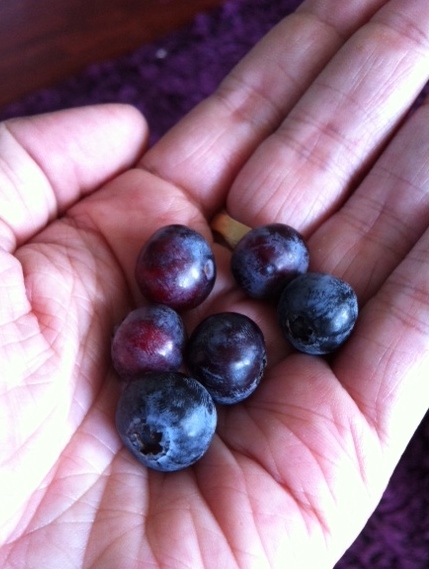 These are the first ripe ones I’ve picked. Trust me when I say they only ‘just’ lasted long enough to take this pic before my kids devoured them. 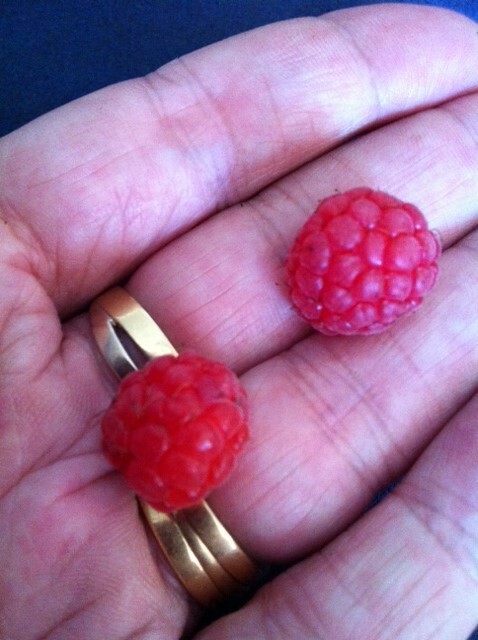 The first of the raspberries were picked a few weeks ago. Right now, we’re getting about six a day from what started as three canes. Judging by the amount of flowers and baby berries on the canes – there will soon be a lot more than that! And finally, the strawbs. 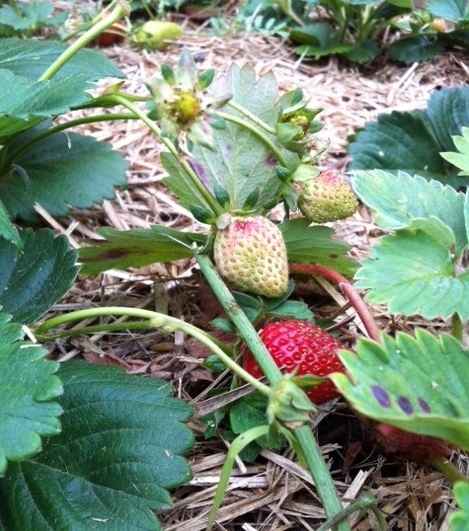 During winter, I split our duo of strawberry plants that had begun bursting from their pots, and planted them in a special new strawberry patch. We’ve had to net the patch due to the local bird-life, but also the possums. It seems to be working. 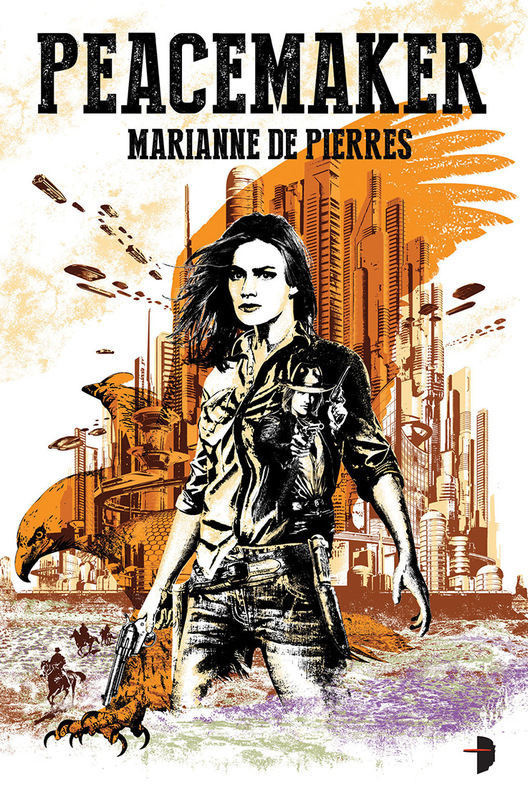 Here is the cover for Marianne de Pierres’ new novel PEACEMAKER. Joey Hi Fi, is the wonderful artist, commissioned by publisher, Angry Robot (and partially inspired by Brigitte Sutherland’s graphic novel illustrations)! PEACEMAKER is due for release May 1st 2014 in UK and US, and as soon as it ships in Australia, you can bet I’ll be on it – you should be too! or … Surviving a Kid’s Birthday Party at Home! My littlest treasure recently turned six years old. Six is a big deal when you’re five and three quarters. Big enough to want to invite twenty-eight five and six year olds to your party. And then there’s the grown-ups. Mr Just-Turned-Six is the youngest of three boys. Any parent of more than one child will tell you that you go all out for the first few birthday parties (if you’re that way inclined anyway) but then reality sets in. Big parties drop off to every second or third year. By the time number three child is around, crunch time has well and truly hit and it becomes a ‘you get one or two big parties and that’s it’ kind of thing. Throwing the birthday party of your dreams is back-breaking hard work. It’s stressful. Expensive. And – notice where I said ‘…the party of your dreams…’ – yeah, well, while the birthday child might be thrilled with the result, they’re not necessarily going to curl at your feet every day for the rest of their lives thanking you for making their childhood the magical, imaginative experience that it clearly is. In other words, kids parties can induce a sort of post-event emotion-dive. Well, that’s how it is for me anyway. Obviously, I over-think these things. So, with all this in mind, I sat down with Mr Six to work out a theme for his party. Monsters? I suggested. Nah, he said. Superheroes? Nope. Not interested. Minecraft, he says. Too tricky, I say (calculating in the back of my mind how few Minecraft party supplies are available). Lego? Nope. Adventure Time? Arghh no! I had visions of crafting teeny tiny Ice Kings and Princess Bubblegums from sticky bits of fondant. And then, in a moment of either brilliance or laziness – because I’ve done this theme before – I suggested ‘Under the Sea’. He said yes. I said yippee! With today’s post, I’m just going to start with the main birthday cake. 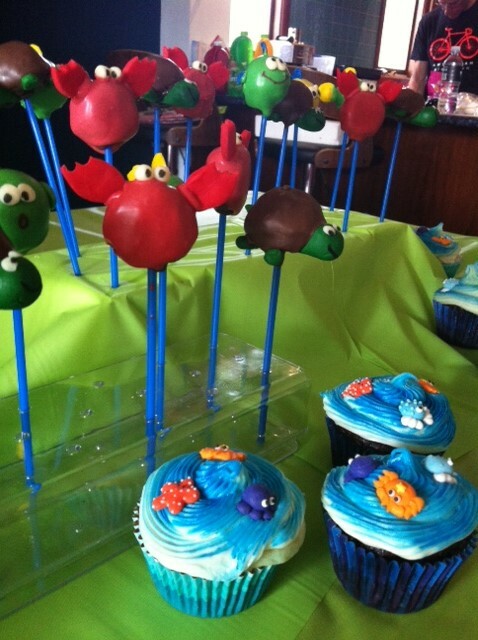 We’ll talk cupcakes and cake pops and decorations soon. 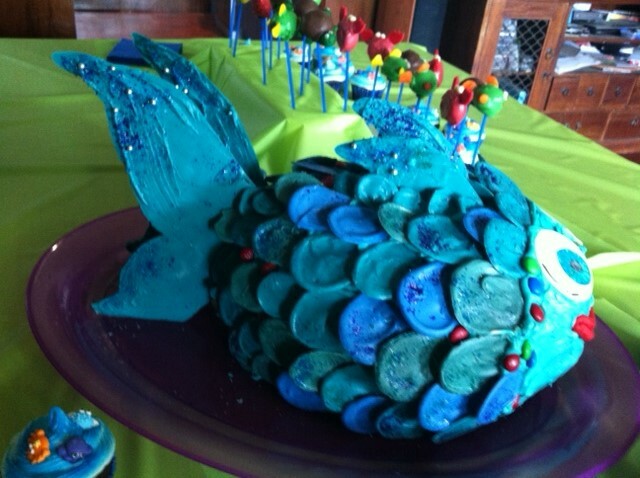 The fish cake is one of those things that looks amazing and complicated and like you’re a super talented cake decorator, when, in all honesty – it’s seriously simple. I started with eight (yes, EIGHT!) commercial packet mixes. I used the cheapest vanilla cake mixes I could find. My big tin is approx. 18cm by 28cm and 8cm deep. It took 4 mixes, and you’ll need two cakes. Mix and bake according to instructions. 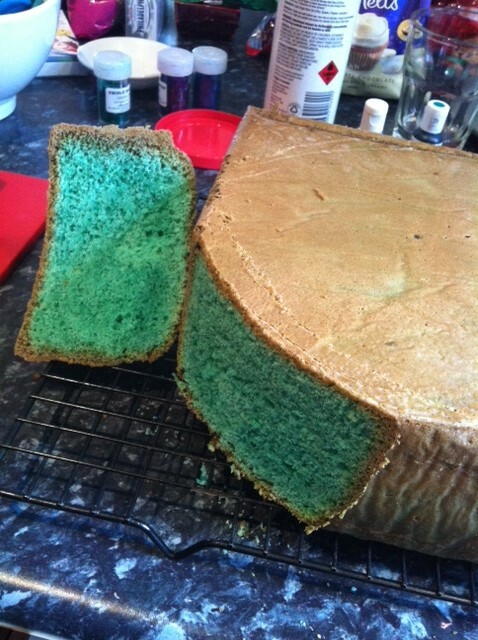 I did add a little extra vanilla essence – because I can’t help myself – and a few drops of blue and green food colouring. Give yourself plenty of time – a cake of this size needs plenty of time to cook, and you need two. 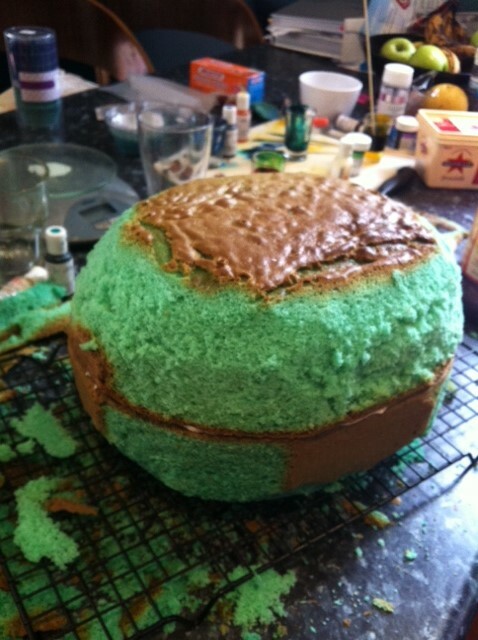 *My star cake tip is always, always take the time to grease and line your tin properly. You’ll need a couple of packets of white chocolate melts, edible glitter, baking or parchment paper and some specialist chocolate food colouring. Using normal water-based food dye in chocolate will result in a nasty seized-up mess of bleugh. Powdered food colouring is fine, as is oil-based. I used a specialist product called Flo-Coat. It’s made by AmeriColor, and available at any cake decorating shop, or online. All you do is mix 5 drops of Flo-Coat to one drop of water-based food colour. I found it easiest to do this in a small glass with a wooden skewer, making sure I had plenty of pre-mixed colour for when my chocolate was melted. I quantities I used were aprox 40 drops of Flo-Coat to 8 drops of colour. Next, lay out a large piece of baking paper on a flat surface. Melt white chocolate using your preferred method. I did mine in the microwave, 30 seconds at a time, stirring in between. I don’t like to work with much more than a cup and a half of chocolate at a time. Once melted, add your colour. Working quickly, add teaspoon-sized scoops of chocolate to the baking paper. Smooth with the back of the spoon to an elongated disc shape, at least 1mm thick. While it’s still wet, sprinkle glitter (or pearls, or any other embellishment). Make sure you make a few different sizes with each colour. With each batch of chocolate, I also varied the colour a little. You’ll need approx. 50 scales of varying sizes. Set at room temperature, and then carefully lift from the paper (it’ll come away easily) and store overnight in an air-tight container. For the fins and tail, draw the shape you’ll need onto a piece of baking paper. Flip the paper (so you don’t get any lead in your chocolate!) and fill in your template with the desired colour of chocolate, using the back of a spoon or a spatula to smooth. Don’t forget the glittery bits! I made two dorsal fins and two tails. You’ll need eyes too, made using plain white chocolate in the same way, with the detail added later by either painted food-dye, or using edible markers (textas). Hopefully you’re so organised the morning of the party, all you need to do it put the cake together. 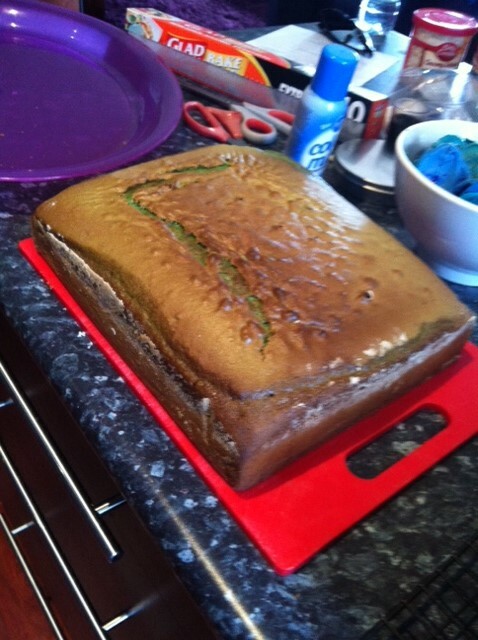 First step is to place one of the already baked cakes on a cooling tray. With a skewer, draw the shape of a fish. Use a sharp bread knife to carve the cake to your desired shape. Basically, you’re just taking off the corners at this point. When you’re done, place the first cake on top of the second, and follow your own lines so the cakes are now the same shape – kind of an oval. Now, you need to use those sculpting skills. Carve your cakes into a more football-shape by taking a little bit at a time. Remember – a little bit. Once you have the basic shape, transfer to the board or dish you’ll be serving it up on. Smoosh the two layers together using your choice of frosting or cream. As usual, I used Betty Crocker brand pre-made vanilla frosting. It’s yummy and reliable. This cake took 3 tubs of frosting. 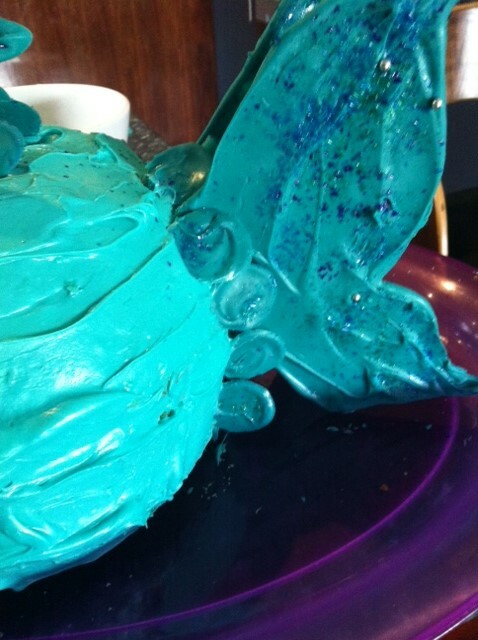 Once ‘smooshed’, tint the remaining frosting to a colour similar to your scales (or you could go for contrast). Cover the entire cake with a decent layer of frosting, paying particular attention to the rough carved areas where it doesn’t stick quite so well. Once covered, make small cuts with a sharp knife to the top of the cake, where you’ll wedge in the dorsal fins, and the back, where you’ll add the tail. Once they’ve been added, gather up your scales and starting in front of the tail, work forward, slightly over-lapping each one. 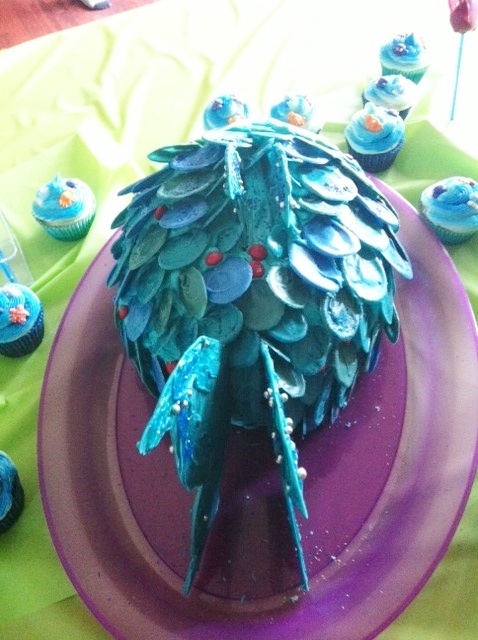 I used the smallest scales near the tail, and the bigger ones near our Fishy’s face. Leave approx. the first third of the fish clear of scales for what will soon be the face. Add eyes, and mouth. 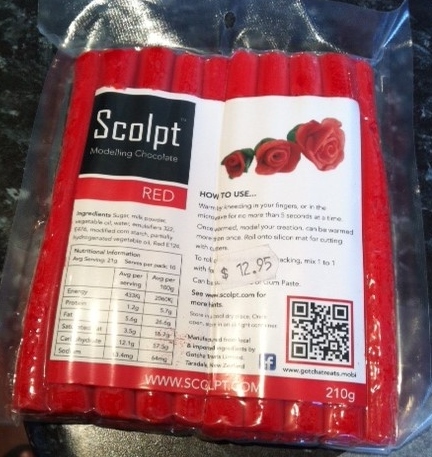 The mouth in this case was made from red mouldable chocolate (also available at your cake decorating shop). After adding a couple of extras – some red and yellow M&M’s to fill in the gaps – you’re ready to wow!